Why are Japanese films so different to those of any other country? Bizarre, enjoyable, but purposeful comedy dramas are a mainstay of Japanese cinema - a far cry from the horror films and animations that are exported to the west. These films can only be made in Japan. Japan has a unique sense of humour that is totally removed from America's more obvious comedy style, or Britain's sarcasm/cynicism. At the same time, Japanese people are renowned for showing incredible attention to minute details and being interested in the strangest things. Hence a film about an insect that can temporarily render a person... dead. An unlikely ensemble - including a journalist, a hippy, a light-hearted suicidist, and an ex-yakuza - go searching for this insect and find a web (ba-dum-chi) of lies surrounding its existence. 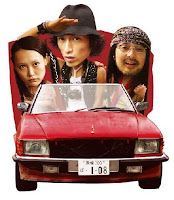 This premise gives director and script-writer Miki Satoshi free reign to include an array of unconnected comedy vignettes alongside a hilarious script that is supremely acted out.